Raised in the South of Israel and then near the West Bank, Kobi Skolnick grew up surrounded by conflict. The M.S. in Negotiation and Conflict Resolution alum ('13) said of his childhood and his time in the Israel Defense Force, “I experienced firsthand the consequences of conflict. Some of those traumatic experiences and loss of loved ones triggered a voyage of self-discovery.” Committed to constructively addressing conflict, he has conducted fieldwork in Palestine, Israel, and Jordan, led conflict resolution and leadership development workshops, and continues to work as an advisor to the UN. Last year, he collaborated with a network of youth leaders, leaders within the UN, and allies from international agencies on a declaration on youth, peace, and security. 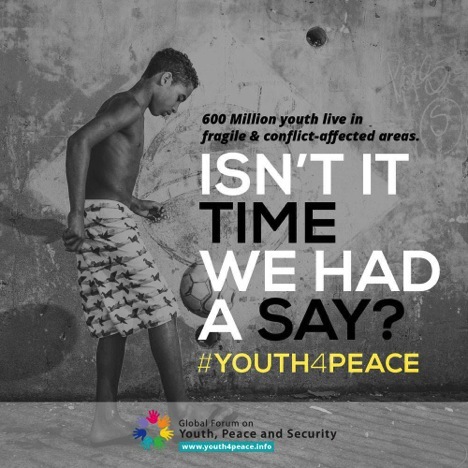 One of the outcomes of the declaration was a global policy framework to deal with youth in conflict. The network put together an eight-page document that outlined the need to develop programs that would cultivate crucial peacebuilding skills among youth in conflict zones. In December, the UN Security Council passed the resolution. “All of the world leaders unanimously approved our resolution,” he said. The adoption of Security Council Resolution 2250 marks a groundbreaking achievement; for the first time in its history, the Security Council recognizes that young women and men play an important and positive role in the maintenance and promotion of international peace and security. From his home in Brooklyn, he spoke with Columbia SPS about his career, the nuances of peacebuilding, and advice for others who want to pursue a path in peace and global social change. Can you tell me about your background and what brought you to the NECR program? My professional life and personal life always kind of intermingled. Growing up in the midst of violent conflict between Israelis and Palestinians, living in an ultra-religious Jewish community, coming of age in a far-right settler movement and serving in the Israeli Defense Forces, I experienced firsthand the consequences of conflict. Some of those traumatic experiences and loss of loved ones triggered a voyage of self-discovery. It also led me to pursue a path to find solutions to conflict without aggression. I was drawn to the [Negotiation and Conflict Resolution] NECR program because, before the program, I worked for seven years in the field as a Director of Leadership Development and also in many initiatives such as dual narrative tour of Israel and Palestine. I recognized some gaps in my knowledge. I enrolled in the graduate program to develop my skills and knowledge to help create more systematic solutions to the social problems that I care about. 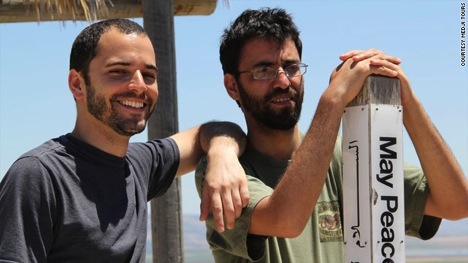 Above: Kobi Skolnick, left, conducted "dual narrative" tours of Israel and Palestine, which presented both sides of the Middle East conflict. Can you tell me about your thesis project for the NECR graduate program? My capstone project was about youth in Syria. I looked at whether or not they were being prepared for peaceful rebuilding after the conflict. I looked at massive reports and spoke with many people. The conclusion was that there was a lack of peacebuilding programs targeting Syrian youth, and that they were not prepared for a post-conflict situation. Many organizations were focused on humanitarian aid, but no one was looking at the skill set needed for Syrian youth to rebuild their future. It was clear that many of them would join the extremist group. Throughout the program, I was writing about the Middle East conflict. Each time, we could predict negative outcomes [using the dynamical system perspective] – but then you would look at what policy makers and international NGOs were doing, and you saw that there were a lot of gaps in their approaches. That made me want to explore the subject. What is the connection between your thesis and the UN resolution on which you recently collaborated? The idea on which I worked collaboratively with various networks that ultimately led to the UN resolution was basically due to my personal experience as a youth in conflict, my work in the field, and the NECR program – especially my thesis. I was running a transformational leadership program at MIT Media Lab. Some UN employees came to the leadership program, those who were working with youth. From there, we started a conversation and recognized the need to cultivate this kind of network. In 2014, I became an advisor on youth, peace and security, and leadership development for different UN agencies. From there, I advised them on different things – peacebuilding, change management, inter-government levels, and prioritizing youth issues and creating this network. I became a member of the steering committee to organize the Global Forum on Youth, Peace and Security hosted by the government of Jordan. I played a key role in developing the concept note, the agenda, selecting participants, etc. That led to outcome documents which called the Amman Youth Declaration on Youth, Peace and Security which was adopted in August 2015 during the Global Forum on Youth, Peace and Security. From this conference, we had an action plan, and part of the action plan was to try to get the United Nations Security Council to pass a resolution. We drafted an eight-page proposal. It was a major process. We had 11,000 youth worldwide contributing to this, we had a committed network, and we had amazing youth leaders and leaders within the UN and international agencies as allies. All of those things together created the atmosphere to pass the resolution with seven co-sponsors, which is pretty amazing. No one rejected it. All of the world leaders said yes to our resolution. In addition to being an advisor to UNFPA [United Nations Population Fund], I founded a company called Leadership for New Emergence. The idea is to guide individual organizations in developing tools and practices necessary for creating sustainable and large-scale change. The company equips leaders with tools, frameworks, and resources to achieve long-term change in a rapidly evolving world, from climate change to extremism, I use many of the concepts that I learned from the program, plus ideas that I learned from others in the last 15 years. Don't focus only on theory. If you feel passionately about an issue, go for it. Dive into the deep end, and even if you make mistakes, you’ll learn from it. Second, build the muscles of collaborative, participatory ways of working with others and aligning your own vision with theirs. And be courageous. I think the world needs people who have the knowledge and the skill set but also heart and empathy, which is something that the program emphasizes.